It was a big football weekend, with my hometeam, the New York Giants coming away with a BIG win over the Atlanta Falcons. Hopefully we can take this momentum and dance our way to the Super Bowl! Next up, the defending champions, Green Bay Packers. Bring it. 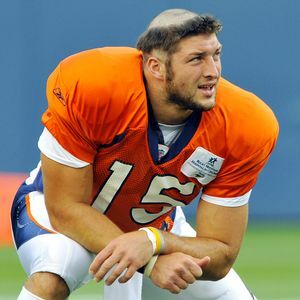 Before I sign off, I just have to mention one of the more polarizing sports figures of the moment, the miraculous legend that is, Tim Tebow. Whether you think he's a good or bad quarterback, he is a fiery competitor who has the ability to rile up his team and get the win. I hated Tebow during his college years when he used to beat up on my Ohio State Buckeyes, recently my attitude has changed. Yesterday in a complete stunner, he defeated the traditional powerhouse Pittsburgh Steelers in the shortest playoff overtime period in NFL history. I watched his Denver Broncos gallup to victory in a bar filled with Steeler's fans. The look of utter shock on their collective faces was something I will not soon forget. You gotta love playoff football.